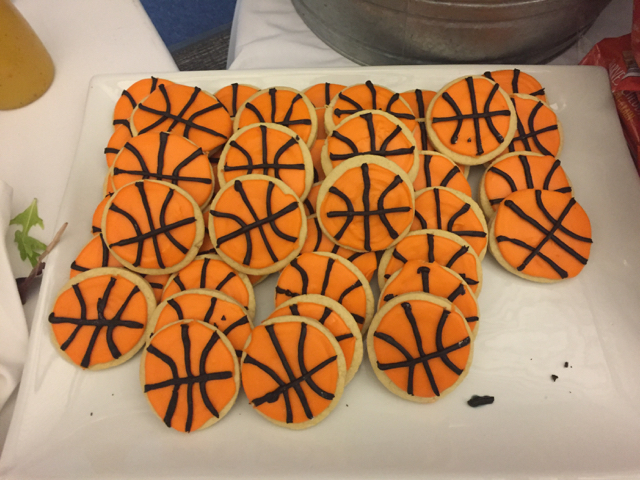 This past Saturday, we held two alumni events on campus, which made for a fun day. The day started off with a panel discussion, led by Director of College Counseling Tim Cheney and featuring nine young alumni. Collectively, they represented eight different colleges and universities: Yale, Wesleyan, Northeastern, Smith, Connecticut College, Hobart William Smith, Davidson and Boston College. 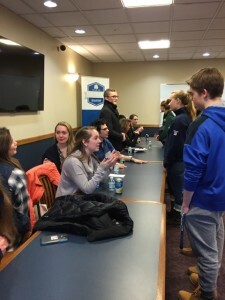 As students in either their first or second years at college, the alumni came back to speak with our current juniors and seniors about their experiences, particularly with college selection process. The group— Henry Lombino, Brendan Hellweg, Cameron Hill, Elyssa Katz, Brittany Collins, Hannah King, Loren Po, Marie Innarelli, Jenna Phelan—spoke for almost two hours on a variety of college-related topics. The workload doesn’t get easier in college but Williston does a great job of preparing you so you know what to do and how to do it. College doesn’t offer the same built-in community available at Williston, so you have to make an effort to get to know your advisor and professors. Luckily, Williston has given you the ability and confidence to do that! Don’t box yourself in with your choices. Look at a wide range of schools since you never know what might ultimately attract you. You don’t want to have any regrets! When you are writing your college essays, be yourself and speak from the heart. Your college experience is what you make of it no matter where you ultimately go. You can be as involved or as disengaged as you choose to be. The choice is yours. Attention, sophomores! 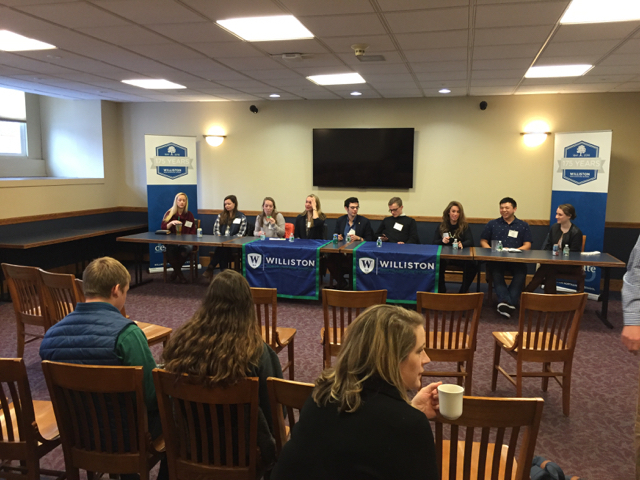 When you are selecting classes for your junior year at Williston be sure to consult with college counseling on your long range goals, which can help dictate which classes to take. In the afternoon, following the boys varsity basketball game versus Deerfield (a rousing 25-point victory), eight alumni and one faculty member took on the varsity players in a jovial, albeit shortened game. 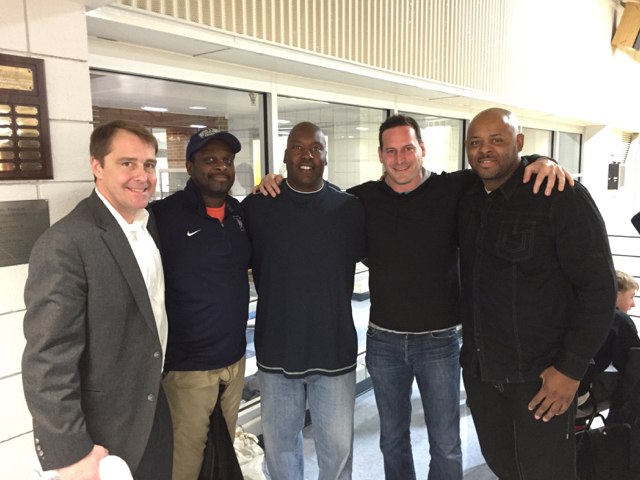 The Class of 1991 was well represented and Malcolm Brown even drove out from Boston just to catch the Deerfield game. Behind the outstanding coaching of Mike Jackson ’90 (okay, so it did take him a while to realize everyone had the number 175 on their backs and that it stood for the school’s 175th anniversary, but still…) and the scoring touch of Ben Harlee ‘91—after travelling all the way up from Maryland for the first time since he graduated—the alumni were able to keep the game close throughout. Trailing by five with less than a minute to go, the varsity put together a run of baskets and the game finished deadlocked. The alumni should have called it quits then, but elected to play a three-minute overtime. The young legs proved too much for the old guard as the varsity pulled away for a 61-57 victory. Following the game, Ben Harlee ’91 was chosen as the winner of the Tiger Craig Award, given to the MVP of the game. There was a reception for the alumni and the current players in the lobby of the athletic center. There were even special basketball cookies. 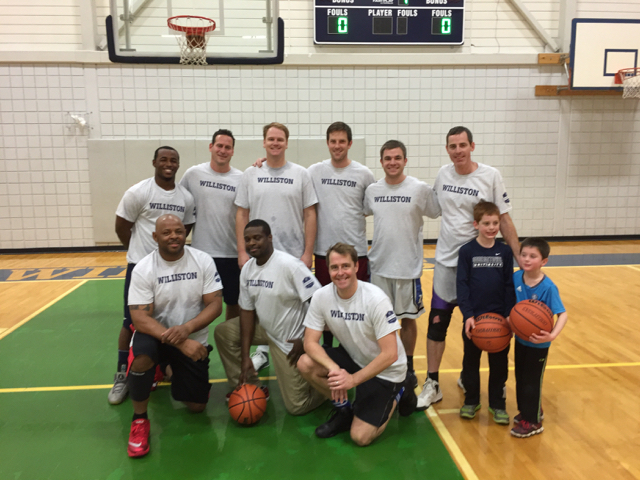 Many thanks to Mike Jackson ’90, Reid Sterrett ’91, David Mederrick ’91, Ben Harlee ’91, Steve Hoyt ’95, Paul McNeil ’01, Will McLaughlin ’05, Sam Slezek ’12 and faculty member Jacob Rivers for coming out to play. Thank you to Monique Conroy and Brittany Weiss ’07 for running the clock as well as Michael Shelton and his entire coaching staff and team for all they did. Next year we hope to have more alumni back!